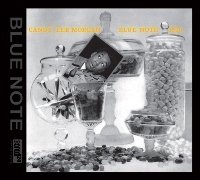 By the time he recorded Candy in 1959, the 20-year old had already led five albums for Blue Note, and had logged valuable time with not only the Dizzy Gillespie Big Band, but also as a member of (what some consider) the finest edition of Art Blakey's Jazz Messengers. Candy is a unique item in Morgan?? ?s history for it is the only quartet album that Morgan ever recorded. In fact, no other horns were needed! Candy features the trumpeter playing with beauty, fire, passion and a mature lyricism exceeding most musicians double his age. Originally released in 1958. Mono. The 24-bit super analog extended resolution compact disc (XRCD24) from JVC brings the listener higher fidelity and improved audio quality by enhancing the process of mastering and manufacturing compact discs. The XRCD24 is compatible with all CD players.